Inspired by conversations on the FOOD52 Hotline, we're sharing tips and tricks that make navigating all of our kitchens easier and more fun. Today, we're talking about oats. 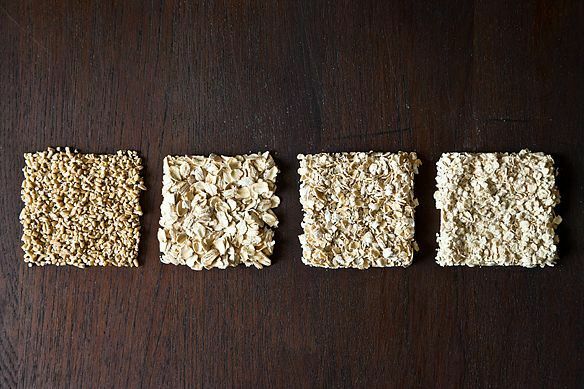 All oats begin their lives as groats, before they're cut, rolled, or steamed. How the groats are processed is what determines their different tastes, textures, and yes, cooking times. How they're made: Groats are chopped with steel blades. How to cook them: Slowly! These grain take about 40 minutes over low, low heat in a pot or in a slow cooker -- this keeps them thick and chewy. A flavor trick: Toast them with butter in a pot before cooking them to bring out their nuttiness. Good for: Adding to granola. Not so good for: Using in baking because they take so darn long to hydrate. 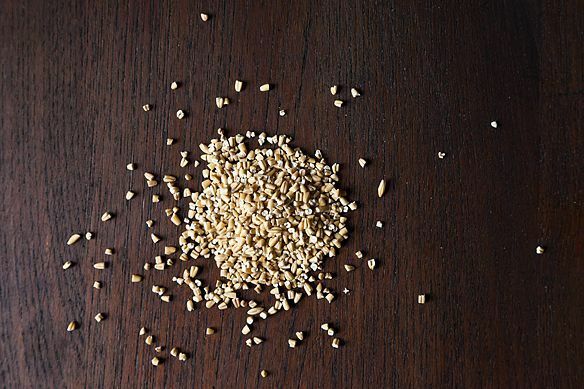 How they're made: Whole oat groats are toasted, hulled, steamed, and flattened to cook evenly and more quickly. How to cook them: In as little as 5 minutes on the stovetop (or 3 in the microwave), they're creamy and ready to eat. But due to all of the processing they go through, they lose some of the sweet, nutty flavor of oat groats. Good for: Baking! Cookies, rolls, granola bars, and tarts often call for rolled oats, lending baked goods of all kinds that familiar hearty, chewy texture. How they're made: Basically the same process as rolled oats, but these ones are roughly cut beforehand. How to cook them: Ready in literally 1 minute, these oats are built for convenience. Stir them into boiling water on the stovetop (or combine with cold water and microwave, if that's how you roll). 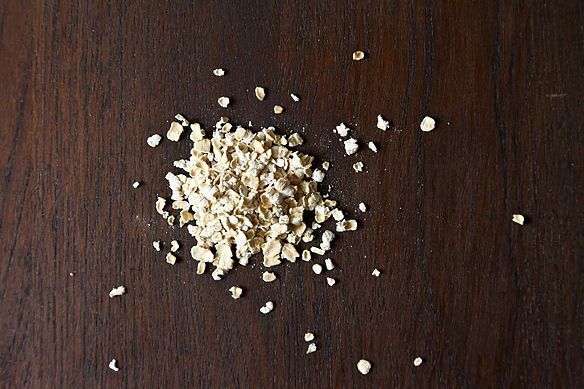 Make them at home: In a pinch, quick-cooking oats can be made by pulsing rolled oats in a food processor a few times. Good to know: In baking recipes, if the type of oats isn't specified, quick-cooking can be used interchangeably with rolled oats. Try them in these easy-to-throw-together flapjacks. How they're made: These oats are cut even more finely and flattened even more thinly than quick-cooking oats, and they're pre-cooked. They're pulverized really. How to cook them: With the addition of boiling water, these oats are ready in, well, an instant. 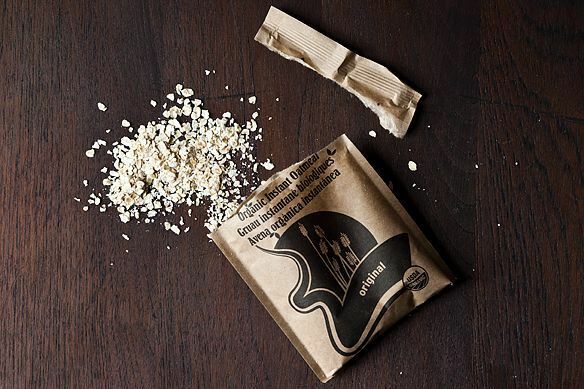 Not so good for: Considering the additives found in most instant oats, it's probably best to forgo them altogether -- or at least save them for your next camping trip. Oats on the run: Fortunately for those who roll out of bed and run out the door in the morning, instant oats aren't the only option. 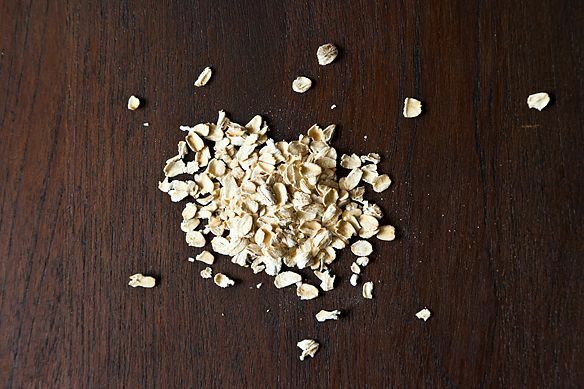 Oats can be made ahead of time by soaking the grains overnight in boiling water and heating them in the morning. Or, better yet, prepare for the week by cooking a big batch of oatmeal, storing it in the fridge, and reheating it in the microwave or on the stovetop with a little milk or water. Nutritional Know-How: Oats contain vitamin B, calcium, iron, magnesium, phosphorus, and potassium. They also contain mineral-blocking phytates, but these can be minimized by soaking oats prior to cooking them -- hence overnight oats. To salt or not to salt? We're pro-salt. Season oats with a big pinch of salt, similar to how you would season pasta water. If I seasoned my oats the way I season pasta water, they would not be edible. I use old-fashioned oats as a basis for Muesli, the Swiss cereal. Mix a half cup of dry oats with chopped nuts, raisins, and cut up fruit. I add rough-grated apples. Add a cup of milk, soy, or almond milk and let stand until the oats soften -- about an hour or so. Question about steel oats: how to add to granola? Cook, dry again then add?? Uncooked would be too crunchy, no? Good question. No need to cook and dry steel-cut oats before adding them to granola. However, your baking time may be a bit longer. And, yes, steel-cut oats will add a pleasant crunchiness to your granola. For my everyday oatmeal, I favor extra-thick rolled oats (available in bulk at health food stores and also from Bob's Red Mill). I dry toast 1 1/2 cups in a large saucepan, then add 2 cups of water and 1/8 tsp salt. Cook uncovered over low heat till the water is evaporated and the oats are just beginning to stick. Stir, cover and leave off heat for five minutes to release. Fluff and serve to six hungry people. These outs come out separate, like fluffy rice and are nice and chewy. Great with almond milk, fruit, nuts and maple syrup! I love oatmeal and am always on the hunt for the best-tasting recipes and brand. I highly recommend Farm to Table, an online mail order outfit that makes the most delicious "Ultimate Organic Oatmeal." And Aarti Sequeira's Pumpkin Oatmeal recipe is yummy, made with pumpkin puree and almond milk. A nice change from steel cut oats, also a favorite. For a lazy Sunday morning, I make steel cut oats without all that stove top stirring by pouring them into a baking dish, adding the required amount of milk instead of water, then whatever I ultimately want in my oats: brown sugar or maple syrup, blueberries fresh or dried or any other fruit -- dried apricots is good, cinnamon, vanilla, whatever I please. Bake in the oven and when it's done, in about 45 minutes, it is divine. Pat, do you cover the dish and then bake in 350 oven?? serve with yogurt and fruit for a nice change! It would help to tell you that you just mix it all up in a big bowl and also that the recipe needs to be baked in a 8 inch glass dish, sprayed lightly for quick release with cooking oil. Bake at 350 F for around 60 minutes or until the center is set and firm to the touch! Around 280 calories a serving based on 8 servings. Look for Bob's Red Mill Steel Cut Oats from Oregon, which won the 16th Annual “Golden Spurtle” World Porridge Making Championships in Scotland in 2009.I believe they were the first non-Scottish steel cut oats producer to win the trophy. The oats have a very good, nutty taste and take about 20 minutes to cook. The company also produces a quick cooking steel cut oats, which I haven't tried. they have a higher protein value to other oats. They are good for making cookies. I use old fashioned oats as a basis for Muesli. The oats are not cooked, but soften in the milk added to a mixture of nuts, raisins, fruit, etc., for a tasty, healthy dish developed by the Swiss. An already boxed version (sans milk(you can use soy or almond substitutes)) is packaged as Familia, with or without sugar. Which type of oats is recommended for topping a fruit crisp? Rolled oats or quick-cooking oats are best for fruits crisps. Sorry about that. The link is now working! Does anyone know if allowing a bread dough containing oats to rise overnight accomplishes the same nutritional task as soaking oats before cooking? Also, if you want to toast your oats before cooking with them, would you toast, then soak overnight? Or soak, then toast? Costco carries Coach's Oats, which I use for oatmeal and baking. It is different than all the above noted types of oatmeal. I think it's work adding to the list; a cross between steel cut and old fashioned? I love the texture...check it out if you go to Costco. Good to know. What quanity must we buy? My Costco sells Quaker Old Fashioned Oats in 10 lb boxes, and we go through it! Never seen Coach's Oats. Since I rather not have sugar or anything else sweet first thing in the morning, I've been making oatmeal mixed with scrambled eggs and white miso and cook it slightly underdone. It tastes a little chewy but works well with the eggs. That sounds so funky I will have to try it! Here is a great healthy recipe for "Oatmeal on the Run" from Chris Johnson of On Target Living. Very healthy and no cooking required. Place all the ingredients in a small bowl with a lid. Let it stand in the refrigerator overnight of for at least 10 minutes prior to eating. No cooking required. Fast, easy, healthy and it tastes good! Give this a try. I was hoping to see an explanation of which of the various food processing companies produce a healthy oat. I have heard that some of the food companies have 'genetically altered' oats that are not a healthy option for your diet. For example, I heard that Quaker produces these 'genetically altered' oats and I should not eat this brand. In fact, what I thought was a healthy breakfast - Quaker oatmeal - is not. Which brand should I buy? How do I know who's using a 'genetically altered' oat (or groat) and who's using the real deal?